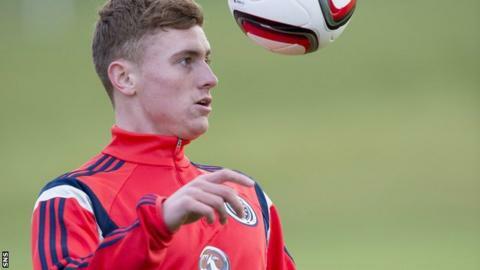 Rangers midfielder Lewis Macleod has been released by Scotland to play in his club's Scottish Championship match against Alloa Athletic. The 20-year-old received his first call-up by Gordon Strachan for the Euro 2016 qualifier against Republic of Ireland and the home friendly against England. But Rangers manager Ally McCoist said: "Gordon and I spoke and Lewis can play for us tomorrow. "He is thoroughly enjoying his time with the Scotland boys." Rangers go into their game at Ibrox four points behind leaders Hearts in second place, with part-timers Alloa 17 points further adrift in seventh. "Lewis trained with us this morning," added McCoist. "I think he is going to the game tonight and he will turn up tomorrow and be in the squad for the game against Alloa." McCoist revealed last week that the Glasgow club's board had decided against asking for the match to be postponed despite Macleod and two other players being on international duty. Defender Bilel Mohsni is with Tunisia and winger Arnold Peralta in the Honduras squad.